**This is a sponsored post written by me on behalf of Foundation Fighting Blindness. All thoughts are 100% my own. For me, I open my eyes and take a look around. I LOOK at the time to decide if I have more time to rest before getting up for the day. I take in the SIGHT of my kids sleeping, soaking up that image as I know they grow entirely too fast. As I get out of bed, I LOOK outside the window to see what the weather is doing for the day, and then I head to my closet to decide what to wear that day- what outfit LOOKS best to me. That's just in the first 10-15 minutes of being awake, and already I've depended on my sight for so many things. If we stop to think about it, it probably is one of the most used senses. We use our eyes to let us know where we are going, to watch our children, to dress... even just browsing online, it's our eyes doing most of the work. Vision is so important. Just think about the stories of Jesus healing the blind, if sight was not important...why would that story be so important? And so, it truly is so important that we show compassion towards those with vision loss, but that we also take care of our own eyes and know how to properly care for them. Right now, most of us probably don't give this too much thought. Even as someone who wears glasses, I still take that ability to see for granted sometimes. But as we age, our bodies change and that can include our eyesight too. 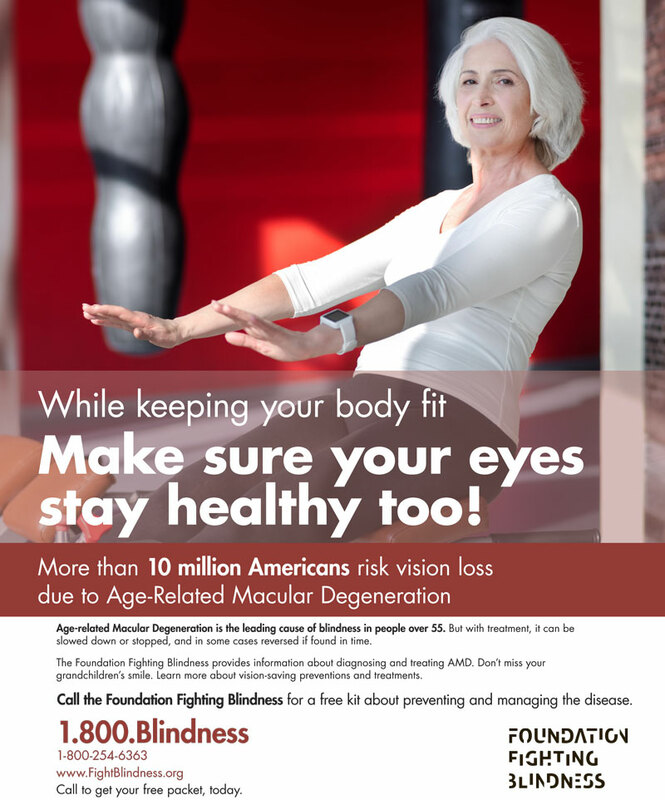 Did you know that more than 10 million Americans are at risk of vision loss due to Age-Related Macular Degeneration- an eye disease that causes loss of central vision. The exciting news is that a cure is in sight! The Foundation Fighting Blindness, a non-profit organization, has provided funding for research on cures for blindness, specifically AMD, since 1971. In fact, with the research FFB has already made possible, treatments to stop and in some cases even reverse retinal disease is a reality. This is great news for people over 55 and their families. With AMD it is nearly impossible for grandparents to enjoy the little things in life such as playing games, watching movies and reading to their grandchildren. However, due to innovative research, those things are once again possible for many people…but, we need to continue this outreach, support additional research and find cures. Perhaps the best place we can start is by knowing exactly what AMD is- what to look for and how it can be treated. If you think that you or a loved one might be experiencing AMD, head on over to download this FREE PDF with more information about AMD. Do you have any personal stories with Age Related Macular Degeneration? Feel free to share in the comments. And don't forget to share this post with anyone who might need it. Yes!! My grandma! She has been steadily losing her sight with age and now is legally blind in both eyes. She can still see but nothing like she used to! It makes me sad for her but Im so thankful she has enough to be able to still paint and knit! I cannot imagine how scary it would be to lose it completely! Vision is such a blessing and is taken for granted much too often. I really enjoyed reading this post. Thanks for sharing!